Despite a number of technical flaws, the original State of Decay managed to convince a small crowd of devout survival players with its original vision of a zombie game. Nearly five years after the first release, Undead Labs partnered with Microsoft on making its sequel an exclusivity for the Xbox One and PC, and even if State of Decay 2 brings a lot of novelties, often interesting, many of the gaps from the first game are still there to tamper the experience. In terms of storyline, State of Decay 2 takes place roughly 18 months after the appearance of zombies and the fall of civilization as we know it. Military forces have failed to stop the invasion, so it is up to the last survivors of humanity to gather in communities and gather their skills to secure a base of operation, develop it and above all survive. The different characters you’ll meet do not have the same background and the same skills, and thus it allows these communities to develop in what they believe is the best recipe. As in the first episode, the walking dead are here to stay and you must be careful with what we do with his characters. The stories of the various protagonists are so basic and discreet that the player won’t be as bummed to lose a character’s effort and skill points than when it comes to the impossibility of completing the plot of the same character. In State of Decay 2, players can choose a character who has reached a sufficient level and make him the leader of his community, and if this changes the goal to be met to reach the “end game” per say, the script of the game is once again so limited that one does not really feel involved in what State of Decay 2 is trying to tell as a tale. Indeed, to live and survive in a social group will require of you uninterrupted effort and work. To survive and keep everyone in good health and relatively happy, the player must constantly improve his base of operation, providing electricity, grow food, allow survivors to rest, as well as search for resources such as food, medicine, ammunition, etc. And that is one of the strong points of the game despite a really overwhelming interface (so many elements need to be managed in-game) which is not necessarily well explained. The primary needs of a human being can never be paused, so State of Decay transcribes the urgency of the situation and the need to go on an adventure is pretty much forced on you, especially to find something to subsist. Gasoline and vehicles in working condition are not available in unlimited quantities, so the vast majority of trips are made on foot, which helps the player feel the world is bigger than it is in reality. That’s the thing because while the three different State of Decay 2 maps is not necessarily as big as those of other open-world productions, these realistic digital treks take a lot of time. The only problem with this system is that it requires a lot of time-consuming round trips, which combined with relatively repetitive actions, can have a sense of weariness. In addition to dealing with these “basic” needs, the player must also manage his relationships with other communities. While it is possible to maintain friendly relations with some, others are simply hostile, with the consequences that it implies. And to make the situation even more tense and consistent, as if a world full of zombies wasn’t enough, this sequel incorporates a bigger threat known as the blood plague, which is found on some undead. When they attack one of the heroes, the latter is infected, and a certain level of infection increases with each attack. Obviously, once the contamination reaches a critical threshold and is not treated (although a cure can be crafted with the right equipment), then the character turns into a zombie. If this hero is not exiled in time, this can have serious consequences on the community, so to limit the risk of spreading the plague, the player can destroy plague hearts. Located at different points of the map these point of interest are protected by many zombies and will require a bit of strategy than just rush in and hack and slashing your way into the action. The biggest novelty enjoyed by State of Decay 2 is certainly the addition of cooperation with other players. While the very concept of the first State of Decay seemed made for co-op play, that option had been strangely absent. In this sequel, groups of up to four players can meet in the same lobby, whether they know each other or not. And so players have the opportunity to host other players in his community or to lend a hand in someone else’s community missions. The bags of resources obtained in a visiting community sadly cannot be transfer to your own base, but the “classic” loot will be preserved. One of the aspects to which State of Decay 2 was expected to really up its game in comparison to the original was its technical execution. The first episode suffered from many bugs, and it is logical to expect they are fixed, but unfortunately, it’s not really the case. From my first minutes in the game, I was faced with a string of bugs, and while some were comical like zombies falling from the sky, others are much more embarrassing, and sometimes even game crashing. For example, an invisible door prevented me from getting out of a house, an allied NPC was stuck on a ladder going up and down, and so on. On top of that, State of Decay 2 is not really flattering when you expect it should be the case since it’s an Xbox One exclusive. The 3D modeling of the characters and the environment is rather basic. Despite this, and if we omit some buildings copied and glued from one area to another, it is possible to say that the world and mood of State of Decay 2 is credible. On the original Xbox One, textures are sometimes slow to load and the machine has some issue rendering a stable framerate, which of course is not the case on the Xbox One X. On the later console, there’s a bit too much of motion blur for my own taste, but the vegetation is denser, the depth of field more pronounced, refresh rate more stable and the loading times are shorter, without mentioning the 4K rendering. Nevertheless, despite the importance given to State of Decay 2 by Microsoft, Undead Labs still managed a relatively modest technical game. In the end, State of Decay 2 is unquestionably the most complete and “realistic” zombie survival simulation. It takes again the already interesting idea of community management of the first episode and adds several new mechanics, plus the much-needed coop mode. On the other hand, the relatively cluttered interface and the very basic narration could push some players away, especially if you don’t take in consideration the numerous bugs and the overall crude visual aspect of the game. 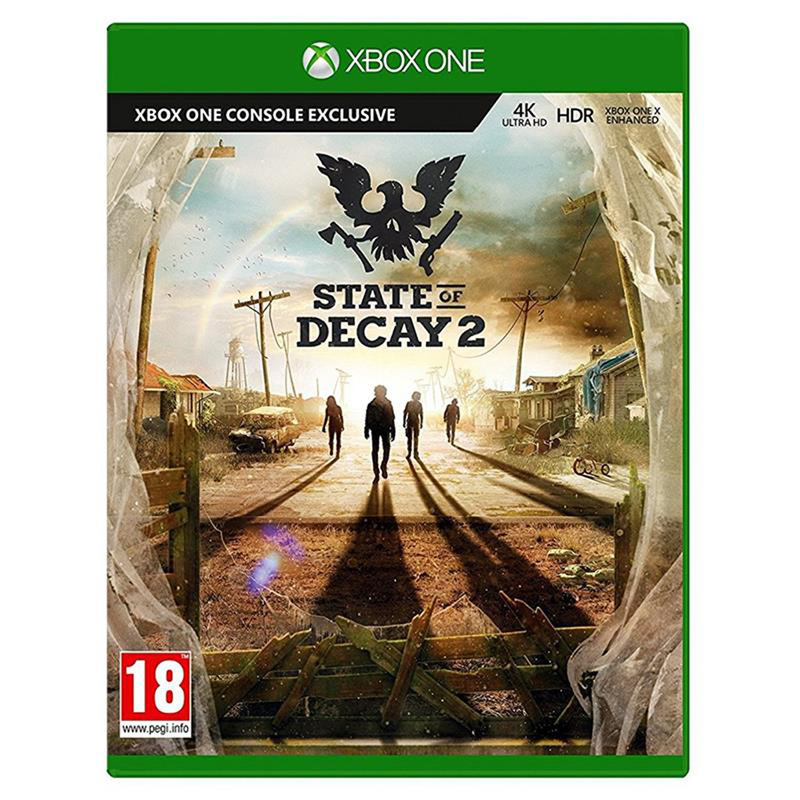 State of Decay 2 was reviewed using an Xbox One digital download code provided by Xbox Gulf. The game is also available on PC via digital store releases. We don’t discuss review scores with publishers or developers prior to the review being published (click here for more information about our review policy). •	So many elements to manage. •	A title that drives on exploration and cooperation. •	An interface that lacks clarity.